Will laptops with AMD's Bristol Ridge chips have Thunderbolt 3 ports, Optane and 3D RealSense cameras? Laptops and tablet hybrids with AMD’s new 7th generation chips, code-named Bristol Ridge, will soon become available. The chip is being positioned as a worthy Intel Skylake alternative. To summarize: AMD is promising longer battery life and performance in laptops with the new chips. The CPU performance is slightly faster, and the GPU is about 18 percent faster compared to last year’s AMD chips, called Carrizo. HP’s Envy X360 is the first laptop announced with Bristol Ridge. Its 15.6-inch screen can fold to turn the device into a tablet. It has about 10 hours of battery life, and users will be able to play back 4K video. 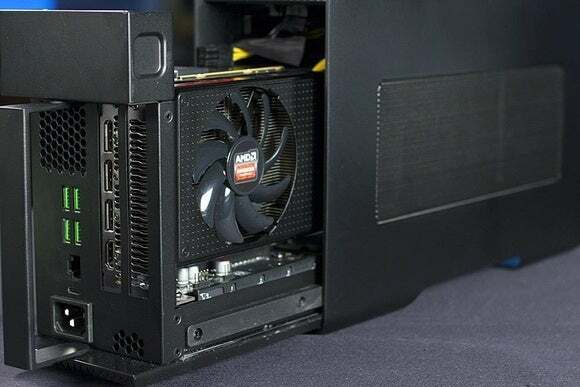 AMD chips typically suffer on CPU performance, so time will tell how good the PC is at running applications like Microsoft Office or antivirus. More laptops with Bristol Ridge will be released later this year, and they may or may not have some cool and futuristic features found in Intel Skylake laptops. AMD didn’t answer questions on features in those laptops, deferring to Computex, when it will share more technical details about Bristol Ridge. Until then, here are five burning questions we have about AMD’s new chips. 1) Will AMD PCs have Thunderbolt 3 ports? So far, no AMD laptop has a Thunderbolt port, which has been exclusive to Intel-based systems. Intel’s Thunderbolt 3 is connector technology like USB, but can transfer data at a mind-numbing speed of 40Gbps (bits per second). Thunderbolt is being widely used to hook up storage and monitors, but it also opens the door to bringing full-fledged graphics cards to multimedia-hungry laptops. There are signs that AMD has warmed up to Thunderbolt 3. It recently introduced Xconnect, in which an internal Radeon graphics card in an external enclosure can be hooked up to laptops with a Thunderbolt 3 port. It remains to be seen if laptops with AMD chips get Thunderbolt 3 ports, though it looks likely. 2) Will AMD-based laptops have RealSense 3D camera? More laptops and tablet hybrids are getting Intel’s RealSense 3D camera, which is considered an important prerequisite for logging into Windows 10 via facial recognition. AMD wants to support the Windows Hello feature in Windows 10 so a wide range of biometric authentication mechanisms can be used to log into laptops. But no AMD laptop has RealSense or a 3D camera. AMD didn’t say if laptops with its chips would get RealSense, but said there are many infrared cameras to choose from. 3) Will superfast Optane memory and SSDs appear in AMD-based PCs? Looking into the future, memory and storage will be much faster with Intel’s Optane memory and SSDs. Optane is based on a technology called 3D Xpoint, which Intel claims can be 10 times denser than DRAM, and 1,000 times faster and more durable than flash storage. We know the technology will be in Intel PCs, but will it be available in AMD-based PCs? Optane could have some motherboard requirements that could shut it out from AMD-based PCs. 4) Will we see detachables with AMD chips? AMD has been shying away from tablets for years, and it’s hunch was correct with that market now slumping. But the market for detachables like Microsoft’s Surface Pro 4 is gaining strength. HP, Lenovo and Dell are moving in the direction of building lightweight hybrids in which screens can be detached to be used as tablets. AMD has indicated its 7th Generation FX and A-series chips are meant for PCs, so it remains to be seen if it will build a tablet-class Bristol Ridge chip that can be put behind a detachable screen. AMD has indicated it can make a chip if necessary. 5) Will AMD overcome Intel bias? Chip enthusiasts either like AMD chips or don’t. AMD hopes to create a more positive sentiment around its processors with its upcoming Zen chips, which deliver significantly better performance. Zen will be in gaming desktops later this year, and then in servers and laptops next year. Analysts agree AMD is putting all its eggs in one basket, regarding Zen, and that if the chip fails, the company’s future is uncertain. If Bristol Ridge does well, it could drum up wider support for Zen and sway away users dedicated to Intel chips, which could help AMD’s cause.